Elizabeth Balfour Ellison was born and reared in Brooklyn, New York where she was one of six (6) children. She early exemplified a talent and love for music which was nurtured in her church, Nazarene Congregational in Brooklyn. She received encouragement as piano accompanist for the Sunday school and as church vocalist. A highlight of her life in New York was the time she spent as a student in the Institute of Musical Art at the Julliard School of Music. Elizabeth Ellison graduated from Howard University where she was a music major. As a member of the famed Howard University Choir, she was called upon often as soloist. Her graduate study was continued at Boston University, the University of Redlands, Redlands, California and Richmond Professional Institute (now VCU). Dr.& Mrs.John Malcus Ellison Sr.
Mrs. Ellison was married for 46 years to the late Dr. John Malcus Ellison, Sr., first African American president of Virginia Union University. As “first lady” of the campus she was privileged to serve as hostess to noted guests including Marian Anderson, Roland Hayes, Langston Hughes, Paul Robeson, Dr. Mordecai Johnson, Dr. Benjamin Mayes and Dr. W.E.B. DuBois. Dr. and Mrs. Ellison were instrumental in bringing African students to the university, many of whom returned to their native lands as leaders. The Ellisons were inspirations to other college students who continue to make profound contributions to their communities. 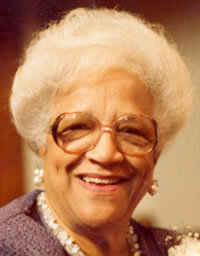 Elizabeth Balfour Ellison was a music consultant in Richmond Public Schools for almost 30 years. During that time she brought the beauty of music into the lives of many children. Additionally, she gave her professional time to piano and voice students. Mrs. Ellison, along with William J. Goodwin, former director of the Virginia Union University choir, organized the Inter-Church Choir, which brought together voices from church choirs in the Richmond vicinity. The Inter-Church Choir stressed musical excellence through quality production of great religious works. In 1951, Elizabeth organized the Virginia Union University Nursery School inspired by David, the Ellison’s busy two year old. The program provided a quality pre-school program to a number of Richmond area children who were from campus families and a cross section of the Richmond community. Great emphasis was placed on providing a nurturing and enriched educational environment. In 1955, the program was moved to First African Baptist Church. Mrs. Ellison was church organist, choral director and Sunday school teacher at the church her husband pastored after his retirement from the presidency of Virginia Union. This church, St. Stephen’s Baptist Church, Caroline County, maintains strong ties with the university. Other volunteer work included: director of the Ministers Wives Choir; member of the Women’s Committee of the Richmond Symphony; board member Phyllis Wheatly Branch of the YWCA where she was chaired the International Committee; member of the Board of Directors of “Meals on Wheels;” accompanist for the "Delta Pearls" of Delta Sigma Theta Sorority; president of the Richmond Branch of the American Association for University Women, where she chaired the International Relations Committee; honorary member of the International Congress of Virginia Union University Graduates and music teacher for the Virginia Union University Nursery School. 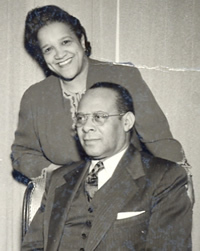 Dr. and Mrs. Ellison reared six children: His twin daughters Geraldine Ellison Kornegay, Mabel Ellison Scoggins and son Dr. John M. Ellison, Jr. and later they reared her nephew, David Clarence Nelson and her two nieces, Barbara Balfour Allen and E. Dianne Nelson Watkins.